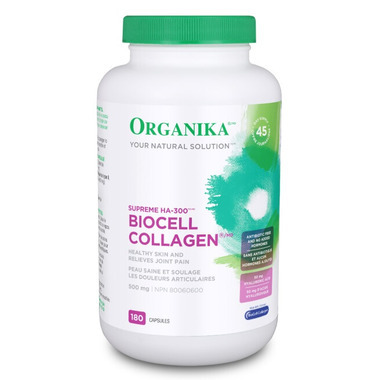 Organika BioCell Collagen® contains a potent dosage of hydrolyzed collagen—an element essential to connective tissue development—which helps to improve skin and tissue development. Excellent source of amino acids like histidine and lysine that are essential for youthful looking skin. Also helps to reduce inflammation around joints for better joint pain management. Directions: 4 capsules daily (two in the morning and two in the evening) preferable 20 min before a meal. This collagen has made a noticeable difference in my skin. I had an injury, and started taking it to help repair my connective tissue. I felt a difference within a week. Thank you Organika. Thank you for this product. My skin and joints have improved a lot. I will continue to use this. In just a few weeks of use I have noticed improved skin tone and hair density. It also is an immune booster which for me is the main reason I will continue to purchase this product.